and Preserve is the chance to walk in this wild place where your feet and desires take you! you are encouraged to find a place that looks inviting and start walking." titled "Where Can I Hike? . . . Anywhere!" Wow! How many parks give you permission to walk off-trail, let alone nearly insist that you do?? 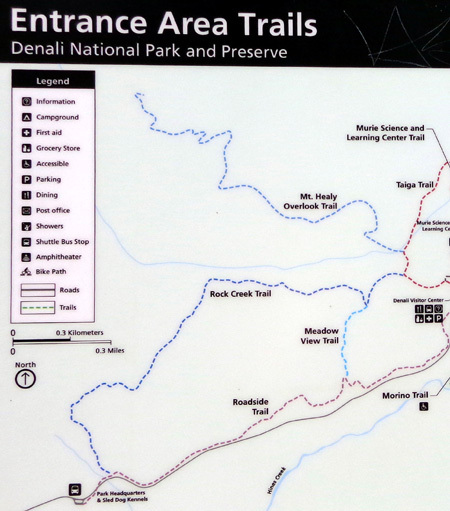 What an opportunity for active, adventurous visitors at Denali National Park. Unfortunately, bicycles and dogs aren't allowed either on established trails at the park or out in the wilderness. They must stick to paved and dirt roads. Still, I'm excited about being encouraged to explore the wilderness on foot. I love going cross-country, especially above timberline where the views are panoramic. In Southcentral and Interior Alaska I don't have to climb very high to get into alpine terrain -- usually only about 2,600-3,000 feet elevation. I wasn't aware of the term "front country" until I started doing research on Denali NP. 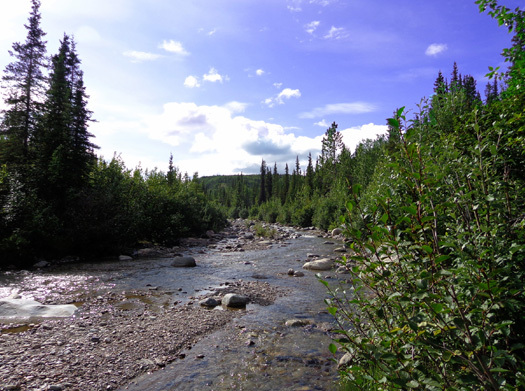 It's more clear to me what "back country" means -- remote wilderness areas off the road grid. 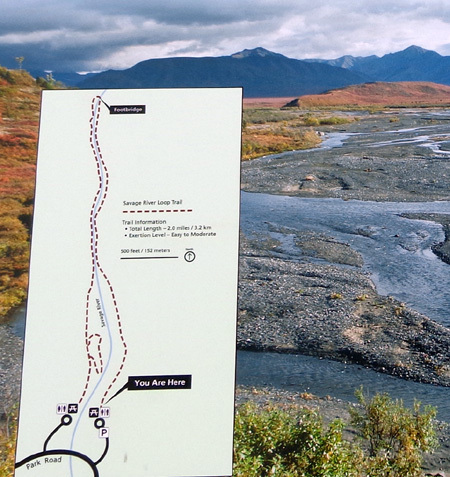 At Denali, there are very few established trails once you get past the Savage River at Mile 15, which is also the end of the paved park road and the farthest most personal vehicles can travel. Beyond that, visitors must ride their bike or take one of the types of buses I talked about in the last entry. Folks can get on and off the shuttle buses just about anywhere they want along the 92-mile park road and start walking in the wilderness. There are many more established trails, some quite civilized, in what the park designates the "front country," which I believe refers to the portion of the park near the entrance and perhaps back three or four miles. 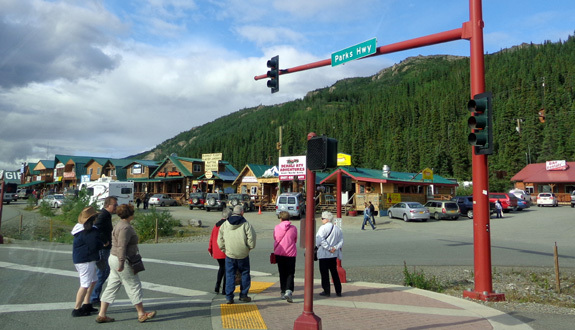 This is where most of the guest services are located -- the main Denali visitor center, Wilderness Access Center, Riley Creek campground and mercantile, Alaska Geographic bookstore, Morino Grill, Alaska Railroad depot, Murie Science Center, sled dog kennels and demonstrations, etc. I don't know if the portion of the park that is accessible by paved road to Savage River is considered "front country" or not. I consider it to be more remote and there aren't very many established trails there. Some folks never venture any farther into the park than the first few miles, especially if they've allowed only a couple days to visit Denali NP. There are plenty of things to keep them busy in this area, however, including a wide variety of trails to day-hike for a few minutes or a few hours. I took a picture of the sign and divided it up into two sections below so it's more legible here. The two sections overlap a little. 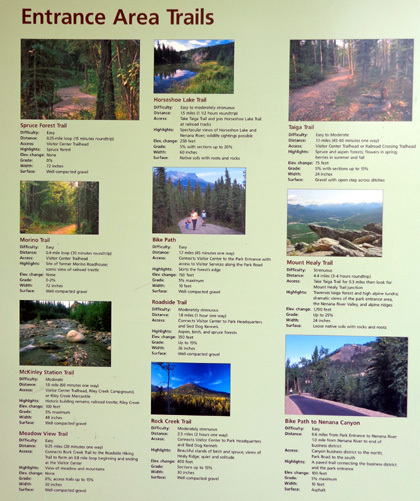 You can also find the map -- and lots more information -- at one of the links on this hiking page on the park website. 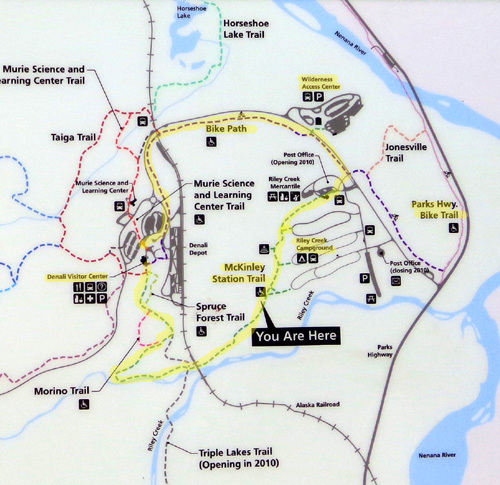 I highlighted the route I walked today and marked the campground, visitor center, wilderness access center, and bike path. This afternoon I decided to hike the McKinley Station Trail because I can access it about 200 feet from our camper. I did a clockwise loop of about two miles, combining it with part of the bike path along the park road. At the end I did another half mile or more through the three Riley Creek CG loops. 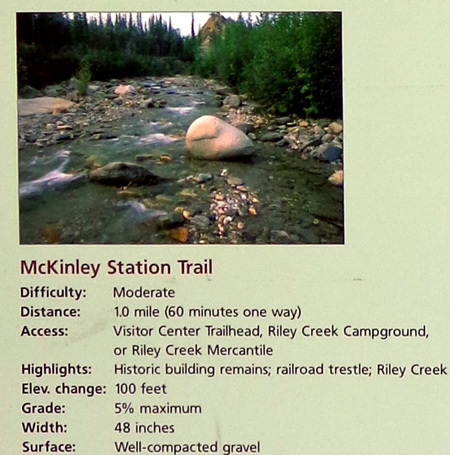 McKinley Station is a near-perfect trail made of crushed rock � smooth, three to four feet wide, not too steep, through beautiful forest and creek scenery. I was wishing I had Cody with me because he'd love the creek. And both Jim and I would love riding our bikes on this trail. Alas, as I've mentioned previously neither dogs nor bicycles are allowed on any of the trails in the park, just on roadways. That does make the trails quieter and safer for wildlife. The protection of wildlife is a major focus in this park. visitor center area but it is still quite smooth. After the trail flattens out again it passes through the former Maurice Morino homestead. This was one of two nearby roadhouses Morino constructed while the Alaska Railroad was being built to the park. 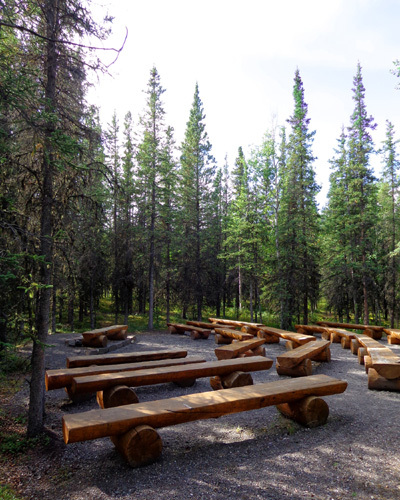 The acreage he owned wasn't part of the park property then but he provided lodging, meals, and supplies to park guests, other travelers, railroad workers, prospectors, and some of the workers who built the park road back to the Kantishna mining area. 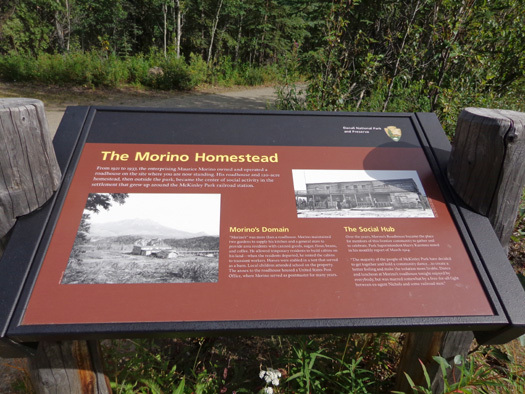 Through the 1920s and 1930s the Morino Roadhouse became the place for members of the frontier community and McKinley Park (as Denali was called then) to gather and celebrate. None of these old log buildings remain today but rangers lead interpretive walks to the area each day during the summer. 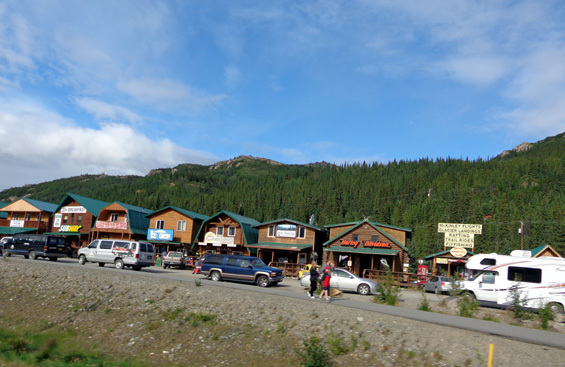 Morino is honored with a nearby trail named for him as well as Morino's Grill, which is next to the Denali bookstore. All the trail intersections I saw today were well-marked. I'm looking forward to hiking on all or most of the trails in the "front country" while we're here. Trails vary in length from less than a mile to more than four miles one way. They can be combined many ways to increase the distance. From what I've read/heard, the trails get less "civilized" the farther you get from the campground or visitor center. Some are easy, some quite strenuous. Sounds like there's something for everyone who likes to hike. There are several established, ranger-maintained trails beyond the developed ones in the "front country" but they are few and far between. 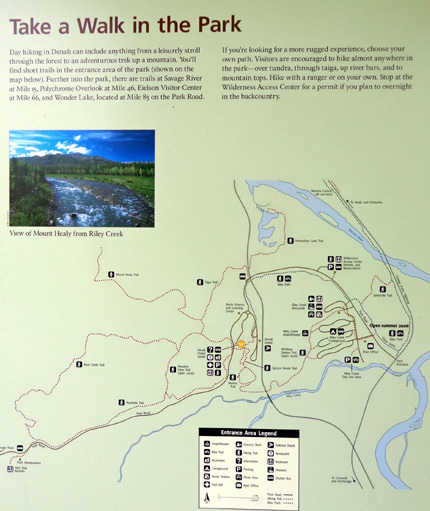 Visitors can access some of them by personal vehicle or free courtesy buses in the first 15 miles of the park road -- near the Savage River Campground at Mile 13 and the Savage River itself at Mile 15. 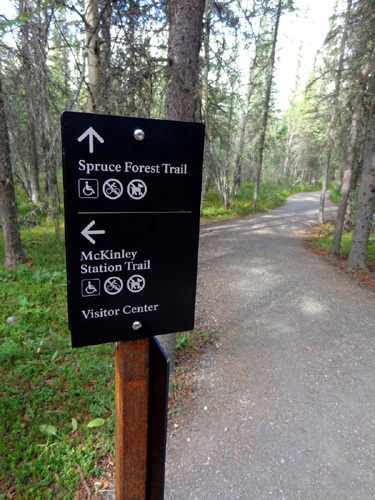 There are also trails at the Eielson Visitor Center at Mile 66 and Wonder Lake at Mile 85. You have to take shuttle buses to reach those. Since I haven't been on any of these trails yet, I'll wait until I hike some of them to report on their length, difficulty, etc. You can also read about them on the park website. 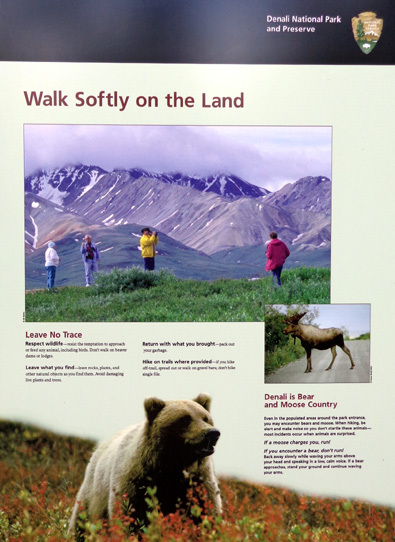 There are lots of ranger-led walks and hikes in the entrance area and from the Eielson Visitor Center. Those are free but you have to sign up for some of them. Off-trail Discovery Hikes require you to sign up in advance and purchase the appropriate bus ticket to the hike location. 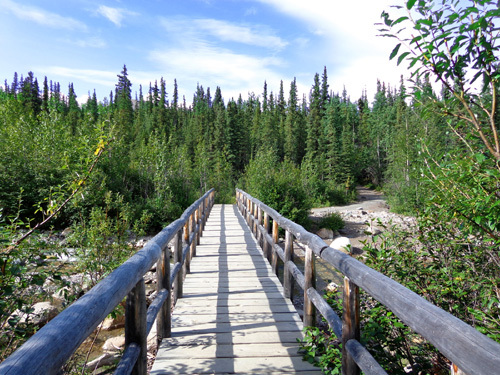 And don't forget that you can hike almost anywhere you want in the vast expanse that is Denali National Park & Preserve, all six million acres of it! That's about the size of Massachusetts, according to one of the links above. 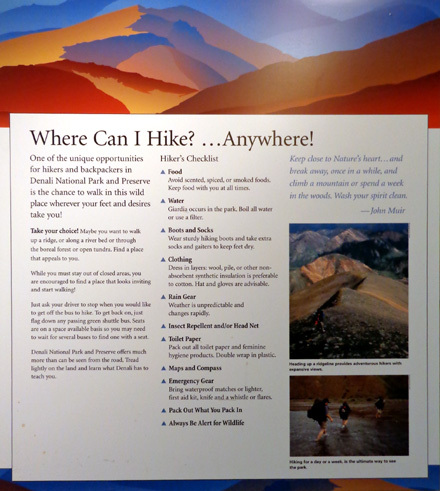 Two hints to avoid getting lost are to hike above treeline as much as possible and to keep the park road or a natural landscape feature like a river or particular mountain in sight so you can find your way back to civilization more easily. 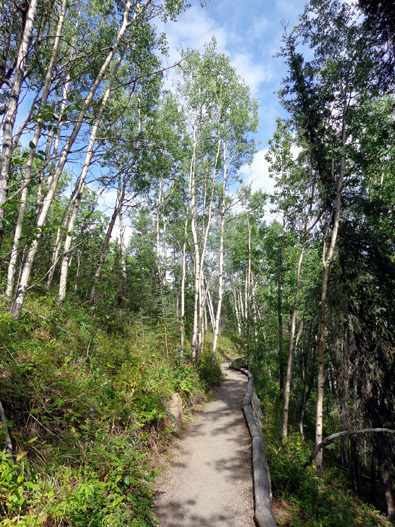 As noted, bicycles and pets aren�t allowed on any of the trails in the park, even gnarly single-track ones. 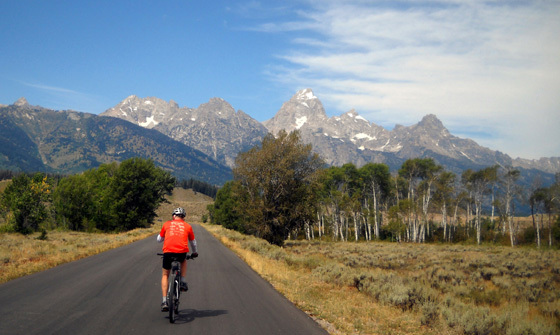 They are allowed only on the paved bike path near the entrance, the entire park road (all 92 miles), and in the campgrounds. 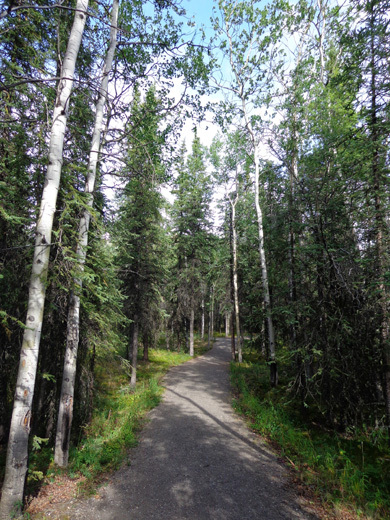 Today Jim rode about five miles through the campground loops, west on the paved park road to the visitor center, and east out the park entrance to the paved bike path that parallels the Parks Highway north for about a mile to Nenana Canyon. 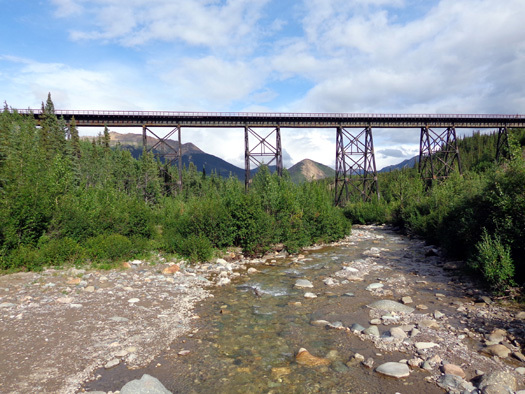 He took these photos over the Nenana River, which is popular with kayakers, to Nenana Canyon AKA "Glitter Gulch" because it is full of sometimes gaudy and mostly over-priced tourist shops and services. Never, ever have we seen such costly milk, bread, or fuel anywhere we've traveled! 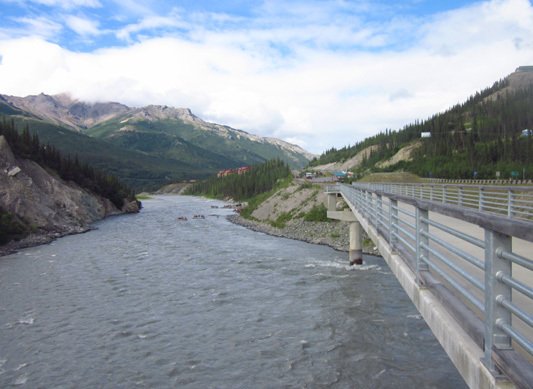 For safety, there's a separate bike/pedestrian bridge across the broad, fast-flowing Nenana River. 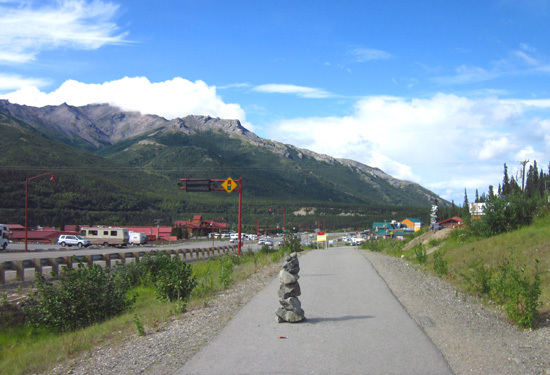 Someone built a rock cairn on the bike path near Nenana Canyon. After I've had a chance to browse some of the stores I'll report back on whether my impression of Nenana Canyon has changed. We're pretty much a captive audience here for the next eight days when we run out of the dairy products, produce, and other perishables we stocked up on before coming up here. We'll either have to pay the going price or do without until we get to Fairbanks or Anchorage. Above and below: visitors head toward the tourist traps. Jim's looking forward to riding his bike farther from civilization the rest of the time we're here. I mentioned in the last entry that he can take his bike on the camper shuttle buses to any point along the park road while we're at Teklanika River Campground. His Tek Pass allows him to ride the buses the four days we're there, if he wants. Meanwhile, he can ride from Riley Creek CG as far out as he wants and back. He can also drive the truck out fifteen miles to Savage River and and ride his bike farther out and back from there. Next entry: this evening's drive out to Savage River (we did a lot today!) and links to some interesting articles about a German RV in our campground, Alaska's "lost summer," the continued search for Michael LeMaitre, and grizzly bear cub triplets that were put down not far outside the park because of the "general mayhem" they were creating . . .